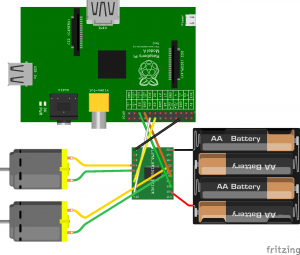 It has been a while since I have posted anything so here we go with a quick post on how to get the motors and H-Bridge connected up to our Raspberry Pi. 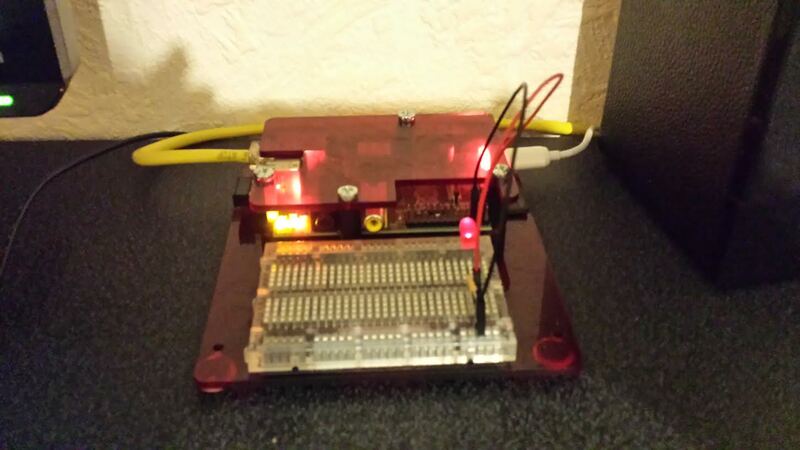 For this project we will be using four of the Raspberry Pi’s GPIO pins, two per motor. In the diagram below you will see a diagram of a L298N (hopefully yours will look the same or very similar). Each motor will have two wires running from them, this will allow us to connect them to “output A” and “output B”. We will be connecting our battery pack up to the +12v power terminal since we will be providing the H Bridge Motor Controller with 6v from the battery pack that is in our Zumo Chassis. We will also want to run the ground from the battery pack and also from the Raspberry Pi to the ground terminal on the H Bridge Motor Controller. This is all there really is to connecting your motors and motor controller up ready for coding our Raspberry Pi robot to move! If you have an questions or suggestions please leave a comment below. Below you will find the example Python code that we will be using to flash the two LEDs that we wired up in the previous post. The first two lines of code are to import the Raspberry Pi module and the Time modules to enable us to use the Raspberry Pi and Time related specific functions. The next line is to set the GPIO pinouts up. Since we are using the standard Raspberry Pi pinouts we just set this as BOARD. After that we will define which of the Raspberry Pi GPIO pins we will be using as output pins. As you may remember from the previous post we will be using pins 16 and 18. The next block of code will send power to pin 16, wait for one and a half seconds before turning the power off again. These few lines of code will therefore light our red LED for one and a half seconds before turning it off. The final block of code is exactly as above but it will light our green LED for one and a half seconds before turning it off. Finally we will run GPIO.cleanup() which will turn off the pins we have been using and return them back to the default state for next time we want to use them. Once you have got your code typed up and saved as LEDs.py from within a terminal prompt run the following command and watch your LEDs light up in turn for one and a half seconds. That is all for this post if you have any issues with this code please leave a comment below. After being introduced to Raspberry Pi controlled robotics by Chris over at Bytemoose.co.uk I have (after owning a Pi since launch) finally decided to do something useful with my Raspberry Pi. The basic goal of this project will be to create a remote controlled vehicle that can be controlled with a smartphone over wifi using a web server that will be running on the Raspberry Pi. Once this basic goal has been met the project could (and probably will) be expanded to install a webcam on the robot or the addition of an ultrasonic sensor to stop unwanted collisions. This should prove to be an interesting and informative project as I have very little electronics experience other than what I can vaguely remember from secondary school well over fifteen years ago. Raspberry Pi – The “brains” of the project this will drive the controller that runs the wheels. USB wifi adaptor – To enable the robot to roam free rather than be tethered via a cable. USB Battery Pack – To power the robot and free the robot from being tethered via a cable. AA Battery Pack – To power the robot and free the robot from being tethered via a cable. AA Batteries – To power the motors and motor controller. Breadboard – This will be used for prototyping and testing components. Zumo Chassis Kit – A two tracked platform that we will build our robot on. 2x 50:1 Motors – The motors that drive the tank tracks. One per side. 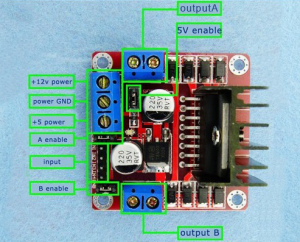 L298N Controller – This will control the speed & direction of our motors. In the near future I will be making further posts and guides on how I have managed to bring my robot to life. Setting up your Pi from scratch. (including wifi and remote access). Building the Zumo Chassis for our robot. Connecting the L298N to our Raspberry Pi and Motors. Example Python code for movement. Installing the webserver on the Raspberry Pi. Creating the scripts for movement. Bringing the web server and scripts together.